Make sure to head over to Gooding & Co.’s site and check out the interior on this car. Like many other Voisin automobiles, it’s wild. If you take a quick glance at this car, it looks like an old, boring, upright sedan. But then you look closer and start to notice all the quirky little details: the weird positioning of the doors, the fender-to-radiator connectors, the strange proportions. And that’s just the exterior. Under the hood is a 2.3-liter straight-six sleeve-valve engine making 66 horsepower. This certainly isn’t the most intensely Art Deco Voisin ever built but it’s still super rare. This car was discovered in the 1990s in France and the restoration was finished before 2007. Like most Voisin’s, the body is lightweight aluminium. Only 1,795 C14s were built between 1927 and 1932 – making it one of the company’s most popular models. This one should sell for between $250,000-$300,000. Click here for more info and here for more from Gooding & Company in Amelia Island. 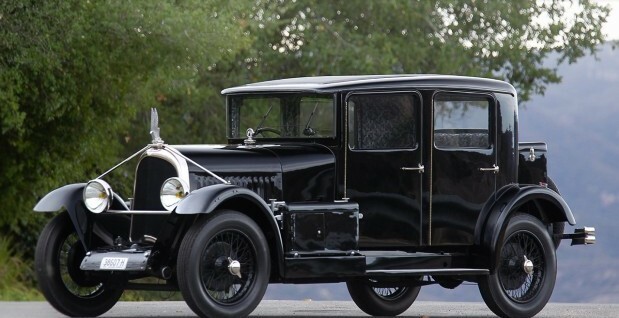 This entry was posted in Uncategorized and tagged 1930, auctions, berline, c14, cars, classic cars, gooding & co, voisin by classiccarweekly. Bookmark the permalink.